On this Thanksgiving weekend in Canada, I thought it would be appropriate to wrap up last weekend’s adventures by giving thanks to those who worked so hard to coordinate our Blend extravaganza, the annual Canadian Design & Lifestyle Bloggers West event that coincides with Vancouver’s annual IDSwest weekend. Karla Amadatsu, Kerrisdale Design Inc. blog & Principal of Kerrisdale Design Inc... see Karla’s work on the cover of September’s Style at Home, and on p. 120-127. A huge and heartfelt THANK YOU! 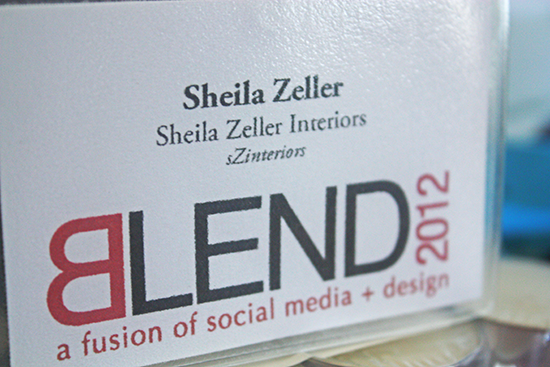 Without your hard work, dedication, and attention to detail, Blend 2012 would not have been the amazing event that it was. 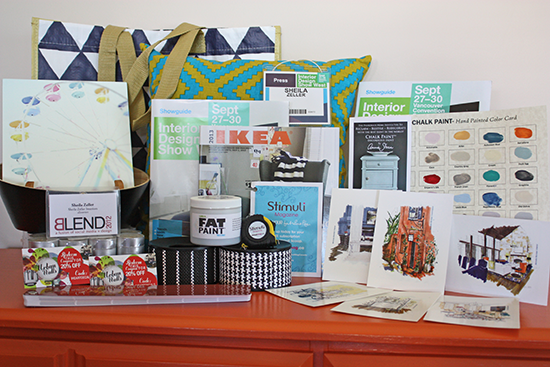 And thank you once again to our premier sponsor, IKEA Canada, who made the scope of this event possible! This year the St. Regis Hotel was our host where we enjoyed a fabulous party atmosphere complete with tasty finger foods and beverages. Also returning this year to lend their support with generous prizes was Delta Faucets. Thank you all so much! And do you recognize these familiar faces? That’s right. Tommy Smythe joined Suzanne Dimma and Mark Challen (Canadian House & Home), to spend some time socializing with us at our party. 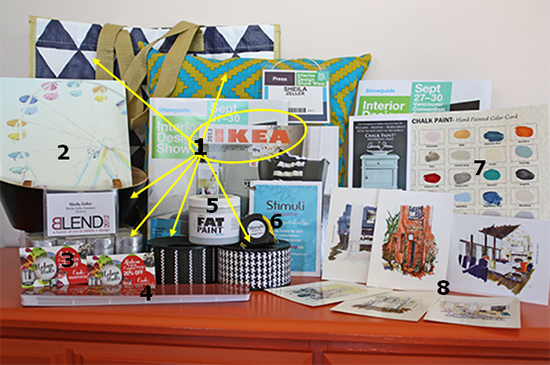 What an awesome surprise… Did you get to take in their presentations at IDSwest this year? Don’t you just love Tommy’s smile?! His wit is equally engaging 😉 Thank you, Barbara, for capturing this photo! All displayed here on the infamous desk painted in Para Paints ‘Sweet & Juicy’ orange (P5072-85)… relevant because Para Paints was the sponsor for the presentation stage at IDSwest this year! And here’s a special shout out to all the businesses that contributed the swag! Artwork… you can see a recent sampling of Tracey’s photography featured on the cover of September’s Style at Home, and on p. 120-127. 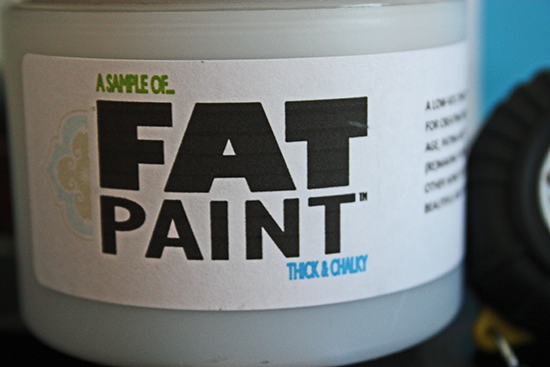 Sample Pot of ‘Grey Gull’ FAT Paint, a new and exciting chalk paint co-created by Victoria Lambert of Edin’s House! 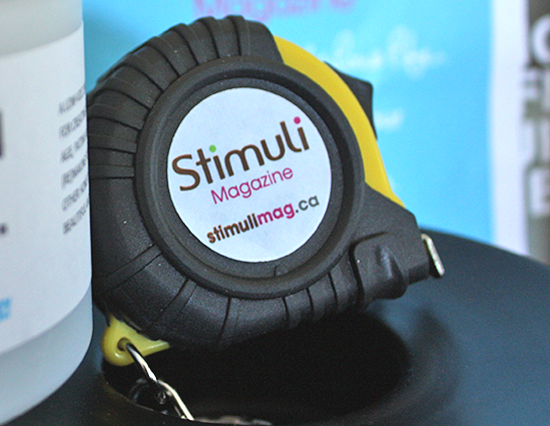 Purse size 5′ Tape Measure and FREE Magazine Subscription Invitation… you can sign up, too! 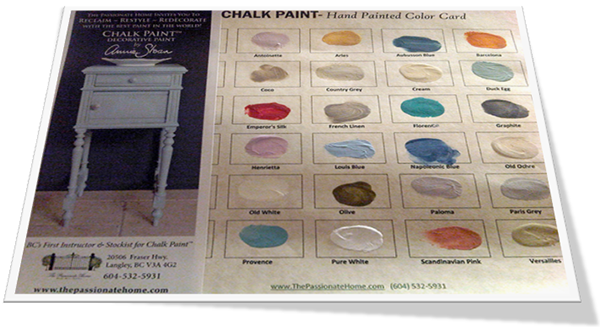 Hand Painted Colour Card for Annie Sloan Chalk Paint… these colour cards are awesome, because the colour sample is an actual dab of the paint! 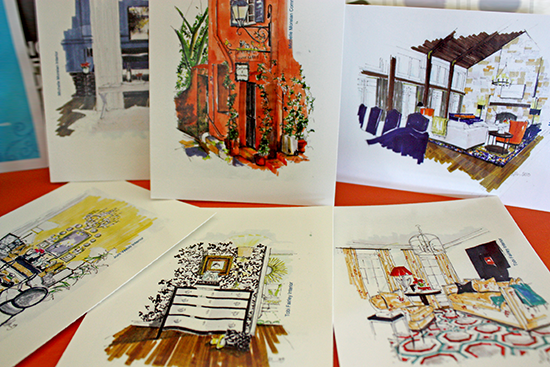 Set of 6 Hand Rendered Cards… did you know Michelle’s work was most recently featured in October’s Canadian House & Home (p. 114-115) and October’s House Beautiful (p. 54)? So there you have it! The swag within the swag bags, and the businesses who helped make them happen! 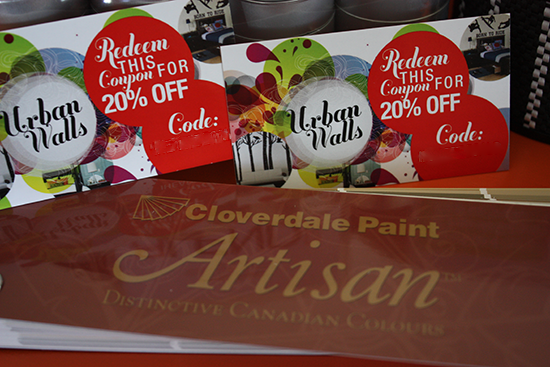 I would also like to mention the amazing door prizes given away throughout the evening, gorgeous items such as paintings by the multi-talented Michelle Morelan (mentioned above), and Heather Ross (you can see a recent sample of Heather’s photography in October’s House & Home issue p. 68-74), decals by Urban Walls (mentioned above), artwork by Nancy Marcus of Marcus Design Inc., gift certificates from IKEA Canada, and many, many more. Thank you to each and every one of you for your contributions! 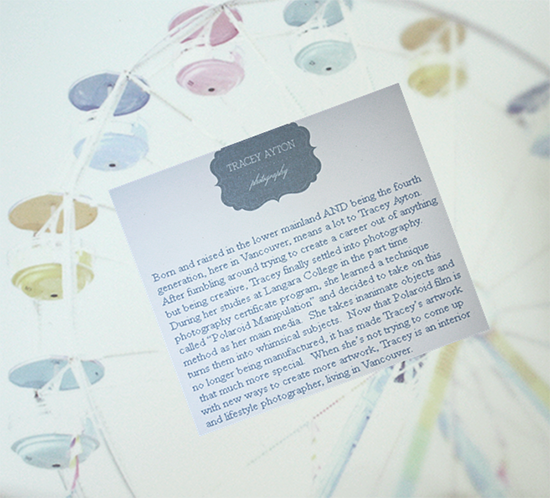 You helped make this Blend an event to remember! And I’m still remembering last year’s! To end on a personal Thanksgiving note… this year Thanksgiving crept up on me, and kind of caught me by surprise. Can I just say, I was so not ready! Fall decorating? The leaves are just starting to turn colour! And the sun was shining all weekend. It was just so beautiful and warm… I still haven’t gotten any major fall decorating done! Eeek!!! But here’s what I did manage for our table. Quick and easy, with a little nod to fall colour. Happy Thanksgiving to all my Canadian friends! I hope you have had a really amazing weekend… and to my American friends, yours is just around the corner 🙂 Have you got any decorating done for fall? Any decorating tips you’d like to share? Photography by Sheila Zeller unless otherwise stated. Looks like I missed a good time. Definitely coming next year! Shauna, it is so worth the trip! The show is incredible, and it’s nice to meet all the bloggers in person. I took it all in from Thursday evening to Sunday, but by Sunday I was completely exhausted and so ready to return home. There’s just so much to absorb – my camera was my best friend! See you next year!!! Darnnit!! Look what I missed. Thanks for the recap, great pic of you and Tommy!!! 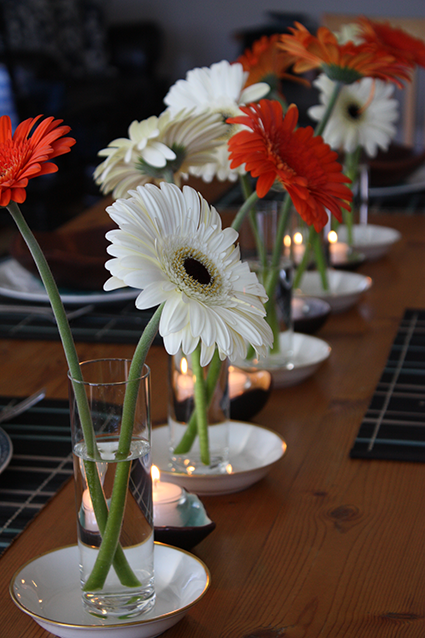 I hope you had a lovely Thanksgiving dinner and long weekend. I’m making sure that I don’t miss next year’s event!!! You got to meet Tommy! What a great photo. And what a wonderful event. I must say, you have a lot of great design events in Canada – it’s so nice. Thanks for sharing – I need to catch up on your previous IDS post. 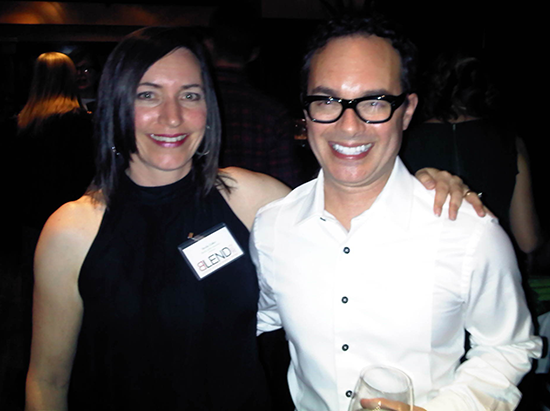 Thanks for the great post Sheila – What a fun night that was, it was great to meet you! Already looking forward to next year 🙂 ! I love the gerber’s they have such a cheery pop about them! Hope you enjoyed your thanksgiving! 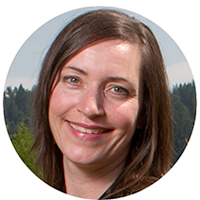 Thank you, Heather – wasn’t the evening amazing? Next year will be upon us before we know it… We had a really great Thanksgiving weekend. Friday is always an unwind night for us, Saturday we spent with friends and shared a turkey meal with them, and then on Sunday I had a family turkey dinner here. Monday was just about relaxing and taking it easy… and today I made turkey soup! The smell in the house is incredible – I love it when fall hits, because that’s soups and stews for us 🙂 I hope your Thanksgiving was lots of fun, too! Looks like so much fun!! Wish I did not live so far- I would really enjoy going next year! Wow! A FANTASTIC post and so appropriate for giving thanks! Great snap of you and Tommy! Hope you had a great Thanksgiving 🙂 It was warm & sunny for most of the weekend here too – not feeling very fall-like at all! 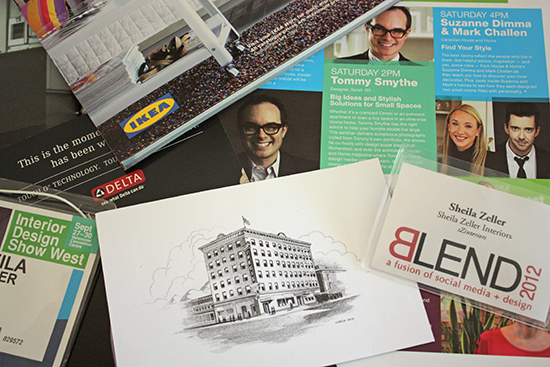 It looks & sounds like BLEND was a great event, and the swag bag is full of so many amazing goodies! Isn’t Tommy fun? We met him a couple of years ago at IDS in Toronto, and he had us in stitches! You got to meet Tommy!!!!! Seriously? I am his biggest fan! I can’t believe it! He and Sarah are amazing. OMG is was such a great time! lOVED IT.!!! Let’s plan to get together Sheila!! The weather is about to turn…perfect opportunity for some yummy coffees somewhere! It was such a great weekend, Hope you had a great fanastic weekend with your family on Thanksgiving. Love the pillow! It’s the perfect POP of color in my bedroom…it looks good on the bird side, but the blue clashes with my other blues in the room if I used the other side. Fun that it works both ways in your room! Thanks for the mention Shelia!! It was really fun! Haven’t made my way down to Victoria, but plan on it soon.